To appeal a long-term disability policy denial, you are going to use a 3-stage approach. You will gather your appeal documents and create a plan, research your policy, and finally assemble your appeal and send the documents to the insurance company. In this article, you will find all the steps you need to complete. However, we can’t recommend that you appeal yourself. Long-term disability claims are not like other types of insurance claims. There are many “gotchas” in the appeal process that can sabotage your efforts to get approved. Long-term disability Attorneys are aware of these pitfalls and can navigate you through the process. Even more importantly, in most cases you get only one chance to appeal. Your next step if you disagree with the appeal decision would be a lawsuit in Federal Court. Here’s the catch: no new evidence is allowed in Federal Court. Your case is limited to whatever you added during the appeal. This is why you have to get the appeal right. If you have questions about any of the steps below, contact BenGlassLaw at (703) 584-7277 and we will explain in further detail. You may be inclined to handle an appeal all on your own. Some people can do that, but everyone should be aware of the risks. The best place to start this process is by speaking to a Disability Appeal Specialist. A Disability Appeal Specialist is a paralegal with specialized experience in ERISA disability claims and appeals. The specialist will be able to listen to your story and give you general information about LTD policies and claims. At BenGlassLaw, it’s free to talk with one of our expert disability appeal specialists. If you need an answer to a specific question about your individual LTD claim and appeal, the Disability Appeal Specialist should schedule you an appointment to speak to an attorney. 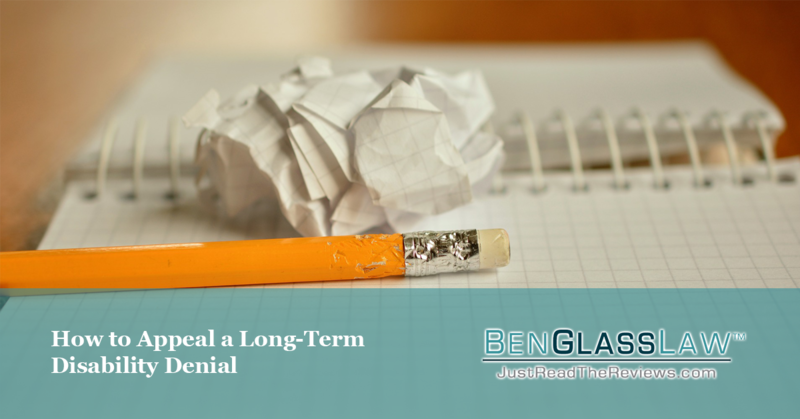 At BenGlassLaw, we offer a flat fee consultation with Ben that includes a review of your policy, medical records, and any other relevant documents. We’ll help you plan for the next step, and if that’s an appeal, we’ll credit the consultation fee to the cost of the appeal. If you work for a government agency or school system, your long-term disability policy is probably not ERISA, but there are still special rules for those types of claims. If you are covered by any other employer-sponsored disability policy, your claim most likely is covered by ERISA. There is an appeal due date for any long-term disability claim. This date is a firm deadline and missing the appeal due date will kill your appeal. In the previous step, you learned if your disability policy was governed by ERISA or not. That information is needed here because the deadline to appeal is different based on the type of policy you have. Warning: Appealing is NOT sending a letter that says, “I appeal” without any other documents or records. What you send the insurance company is what they will use to evaluate your appeal. You can’t artificially extend the deadline using a simple letter. Make sure your appeal is complete before you send the insurance company anything. These are some common errors in a long-term disability claim, but there are many more that only an ERISA attorney can identify. Please be sure to at least consult with a long-term disability specialist before you procced. Here is where the process gets complicated. You will need to study and learn about ERISA law to determine if the insurance company did everything they were supposed to do while reviewing your claim. If you find an error in your denial letter, you will report it to the insurance company and your employer in your appeal. Finding these errors will require a lot of reading and learning. Most people have a very hard time absorbing that much info in a limited timeframe. Remember, depending on your policy you only have 45 to 180 days to appeal. You will need to decide if that is enough time to learn everything you need to know. If the insurance company has used a vocational rehabilitation expert, sometimes you will see a Transferrable Skills Analysis. Make sure that the vocational and medical data is relevant and up-to-date. They can change your occupational title, but they can’t completely disregard what you have been training to do for your entire life. You will also be researching the doctors and/or medical experts assigned to evaluate your case. We often see the same doctors used in claim reviews. These doctors have a financial incentive to decline claims, because that serve the insurance company’s interests. If you can gather enough information on these “experts,” you will start to see patterns of behavior that you may be able to use in your appeal. Your goal is to convince the insurance company that you meet the criteria in your long-term disability policy. To do this, you need to find errors and overlooked information in your claim file. You will be looking at medical records, expert reports, and even video surveillance (if the insurance company hired a private detective to monitor your activities). Most people aren’t aware how far the insurance company will go to avoid payment, and this includes outright spying to catch you performing physical activities. If the insurance company has video of you mowing your law when you are supposed to be bedridden, there isn’t much you can do. Commonly, the insurance company is willfully overlooking information and cherry-picking information to deny your claim. You can overcome this by reviewing the information yourself and discovering the errors and pointing out evidence the insurance company ignored. Additionally, you can ask your doctors to comment on the medical records in your file. Take all the information you discovered during your review and assemble it in an appeal package for your insurance company. This appeal package should contain EVERYTHING you discovered about your claim during the research and review stages. Remember: your next step if the appeal is denied would be a lawsuit in Federal Court, where no new evidence can be added. Don’t save your best evidence “just in case.” Put it ALL in the appeal. A highlight of the information the insurance company missed or failed to include in your claim review. Information from your doctor or other medical experts with an accurate description of your condition. An accurate description of your job provided by your employer, vocational expert, or yourself. Information about prior long-term disability cases like yours where the claimant received benefits. The opinion of an appropriate medical expert if the insurance company used the review of a doctor with no experience with your medical condition to justify denying your claim. Articles from medical journals that support your claim. Do your best to counter each reason for denial when you submit your appeal. Make sure your appeal is submitted before the appeal deadline (see step #3). Remember, this is your ONE SHOT. After you submit your appeal, you will not be able to add evidence to your claim file. If your appeal is unsuccessful, file lawsuit in federal court and prepare for war! You can call a lawyer, but if you are this far in the process, a lawyer may not be able to help you. At BenGlassLaw, if your appeal has been denied we will review your claim file for a flat fee and let you know whether you might have a case. If we file a lawsuit for you and are successful, we’ll credit the claim file review fee to the litigation fee. At BenGlassLaw, we will always tell you if you DON’T need a lawyer. We only take cases where we can add value to the process. For example, if you have a small accident case, we will happily review the claim process with you and tell you how to settle the case yourself. However, there are no “small” long-term disability claims. You have bills to pay and a family to support, and you need the income from your long-term disability policy. You only get so many chances to be approved, and once that opportunity is gone it will not come back. Staring at a disability insurance denial letter feels like a punch in the gut. You counted on these benefits and trusted that when you needed them, you’d be covered. A denial letter can be overwhelming, but don’t freeze. Keep moving. Reach out for more information and take this a step at a time. Before you attempt to appeal yourself, contact BenGlassLaw at (703) 584-7277. We will give you all the information you need to make a smart choice about your long-term disability claim.